Noor converted to Islam in 1980 and at the outset struggled to find professional and modest clothing. She started to sew her own clothes or would tweak store bought items. She was often asked, "Where did you get that outfit?" It occurred to her that it would be a service to Women living in the West to develop a clothing line that reflected their professional lifestyle, are made in a socially conscious and sustainable manner, and cover the body as dictated by Islam. 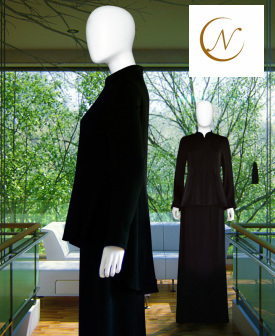 NOOR COUTURE offers a combination of natural textiles, expert tailoring, and a refined look that will take a woman to work and beyond. The primary focus is on garments that are easy to wear, allows the professional woman to feel sophisticated, confident, and stylish while maintaining a modest look. At Noor Couture, patterns are carefully developed by expert pattern makers to ensure its classic features: A high neck-line, tailored fit through the shoulders, loose bodice, long skirts with neither bulk nor slits, and wide-leg pants. Careful consideration goes into each design to bring the customer comfort and wearability in various climates. Noor Couture is a socially conscious boutique and is defined by a manufacturing ethos. The garments are made in the USA in factories that respect workers' rights. Yes, it does cost more to manufacture in places where workers are fairly treated and well paid, however the alternative is ethically unacceptable. See the 2014 Collection Video here! The designer and founder of La Merveille is Kadiatou Diallo (KD). She was born in Guinea West Africa. As a child she loved fashion and everything that went along with it. Kadiatou graduated in 2011 from the International Academy of Design and Technology in Chicago where she studied fashion. Kadiatou began wearing hijab in 2010 and she found it very difficult to find something that would fit. Upon graduation she decided to start designing clothes that will help women dress more comfortably. Since then she has designed a unique brand for the youthful, fashion conscious every day consumer. The designs created for La Merveille are African inspired, strong, and beautifully crafted, which Kadiatou refers to as, "affordable luxury." La Merveille is a French word that means exceptional quality. Kadiatou's inspiration comes from art, architecture, color, and by the conservative women's garments in African culture. La Merveille is all about quality, highly detailed craftsmanship, and providing Muslim women a modern, chic, and comfortable alternative to their everyday wear. La Merveille does not believe that you have to choose between dressing modestly and dressing fashionably. Everyone is welcome whether you're Muslim or not. Ivette Nouti has been passionate about fashion since the age of 15 when she modeled Gala dresses in her native Puerto Rico. It was doing this time Ivette developed a love and appreciation for the intricacies of formal wear and its elegance. Shortly into her adult years Ivette decided modeling wasn’t the right career path for her and transitioned into a corporate career as a bank executive with a focus on Retail Management and Commercial banking. During the time of an economic meltdown many changes took place in the banking industry. Ivette became unhappy in her current career path as it no longer seemed the bank’s focus was on serving the customer’s best interest. She sought a change in career paths that would allow her to provide a valuable service to individuals. It was while on this journey in search of a change, Ivette’s thoughts turned back to fashion and her interest were rekindled. After being invited to various formal occasions, and realizing how difficult it was to dress modestly and elegantly for these occasion, her niche in fashion begin identifying itself. While not a designer by profession, after experiencing difficulty finding modest, elegant clothing that catered to hers and her daughter’s needs as Muslim women, Ivette decided to revisit her passion for fashion and has since worked hard to perfect her craft. The cultivation of her passion is embodied in the timeless elegant fashion formal coordinates of the DOLS Designs collection. DOLS Designs is a Chicago-based business operating online. All garments are made in the USA. Akilah Baynes is the founder and designer of Akilah Fashion (AF), a clothing line that specializes in Fashionable but Modest Muslimah Wear. Drawing inspiration from the notable fashion-worthy trends of the city of Philadelphia where she was born and raised, Akilah demonstrated hints of her future craft when she begin styling clothes from a young age. Akilah’s interest and love for fashion was further influenced by her maternal and paternal grandmothers, both of which were designers and seamstresses – one in RTW and the other in Bridal Couture. To her own surprise Akilah eventually found a niche in modest fashion and followed in her grandmothers’ footsteps pursuing her own career as a fashion designer. Though genetically blessed with the gift of sewing, Akilah consulted her grandmothers’ help to perfect her garment construction skills when she started making her own wardrobe in 2005. A couple of years later she was ready to take her craftsmanship to another level forming and launching Akilah Fashions (AF), a collection catering to women seeking to guard their modesty without feeling the need to abandon trends. Akilah Fashions opened the doors to it first retail establishment in Philadelphia in 2009. Since then based on the need to expand in an effort to accommodate its growing client base, the business was recently relocated to its current home nestled in the town of Chester, PA.
Today Akilah Fashions is a well branded and respected label in the Islamic Fashion community with a solid client base in Pennsylvania and surrounding states. Additionally, the brand has a national reach as a result of a successful Ecommerce operation. Akilah only anticipates upward growth for the business and continues to set challenges for herself and her business strategically aimed at getting her the next level of success. Ever an avid lover of fashion designing as a craft, Akilah gives back to the craft by working with aspiring designers to help them learn the basics of sewing and designing. Jalila Qadira Muhammad’s interest for fashion and sewing began when she was in her late teens. She would help her mother sew hers and her sister’s Eid outfits and later branched out to making clothes for others on her own. Her passion for fashion led her to pursue a diploma in Creative Fashion, which she was awarded from Toronto’s George Brown College. Throughout Qadira’s journey in fashion designing, she dabbled in many categories of design before finding her niche - modern Muslim attire. 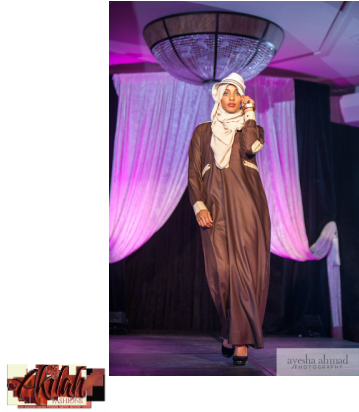 Since coming to understand and further develop her design sense Qadira’s Qreations has been featured in fashion shows throughout North America including; Toronto, Atlanta, Chicago and Washington DC. 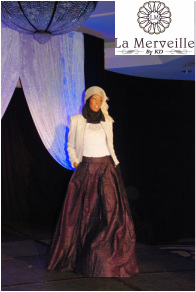 Her designs have also been featured in Azizah Magazine. Ignoring borders or boundaries, Qadira’s Qreations features cutting edge, urban, modest day wear styles. 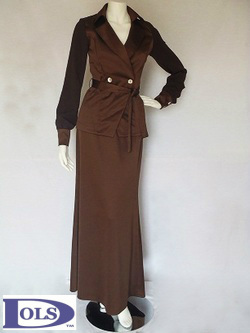 The collection feature garments that will make a woman feel confident while being productive and covered. Standing by the line’s motto “To Create Clothes That Caress and Impress”, Qadira fuses patterns, fabrics and colors into bold wearable art statements. In addition to being a fashion designer, Qadira is equally talented as an inspiring Spoken Word artist. She assists her husband, Tahir, to arrange monthly sets for young Muslim artist in the Washington, DC area through his organization Crescent Moon Nights. As a member of the USA Islamic Fashion Week Executive Planning Committee, we are looking forward to seeing the development of her skills as a show producer, which she has also done for other productions in the past. 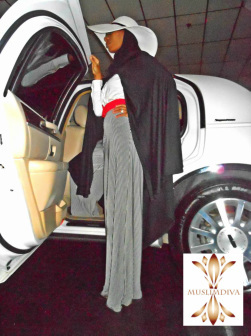 A native of Philadelphia, Pennsylvania, Hadiyah Weeks is the owner and designer of MuslimDiva a line that specializes in clothing for Muslim Women. The sixth of seven children, Weeks has had a keen eye for fashion since childhood. After learning about Islam as a teenager, she became Muslim at the age of 16. She began her career as a designer at the age of 21 after attending just one sewing lesson. She than began creating clothing for herself and close friends. After several years of sewing, her husband of more than 18 years convinced her to use her gift as a service to the community by producing affordable clothing for the Muslim Woman. She has been designing and bringing to life exclusive garments for herself and others in the Muslim community in the USA and abroad. In 2005 she conducted her first fashion show in Charlotte, North Carolina and later opened Hadiyah’s House of Hijabs a brick and mortar store. Later she moved her business to the online realm. With this success and the growing popularity in her creativity and talents, Hadiyah is planning a re-launch of her clothing line with a new name, Modestly Adorned. The line will continue to show off her unique style that has generated broad appeal to Muslim Women all over the world.